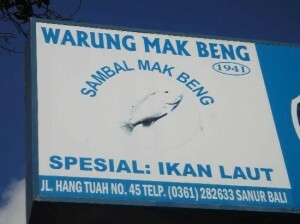 Located across Sanur beach, Bali, Warung Mak Beng is known as a one-dish eating house that lures in local people, domestic tourists as well as regular visitors by the table-ful. It has been established near the Grand Bali Beach Hotel since 1941. Mak Beng the founder, initially known as Ni Ketut Tjuki, has now reached the age of 86. With 28, 000 rupiah, you are going to get yourself a fried, meaty piece of ikan laut goreng (fried sea fish), in this instance snapper steak accompanied by a amazing smoked sambal and kaffir lime on the side, fish head (or vegetable) soup and a plate of rice. The venue is so small that you have to line up in order to get a seat. 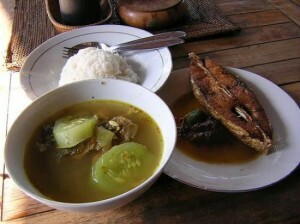 The actual menu here is just one variety: Indonesian fish soup and fried fish with hot sambal only. The simplicity of Mak Beng food stall, whether its menu and its stall, overwhelmed by the uncountable customers, local residences and foreigners, which has served their taste buds for many years. Though situated at the hot spot of holiday makers, Mak Beng sea fish stall always at its modest style with a full serving of only 40 seats. 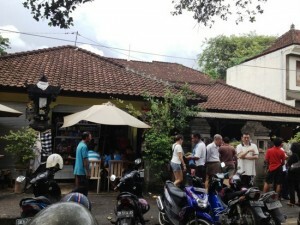 As to the limited capacity, customers usually wait patiently at the neighbouring sidewalk for a seat or buy a takeaway. Definitely fresh and hot. Perfectly cooked . Serve in a swift.